The Hollenden Hotel, c. 1905. PC. The Hollenden Lobby. E.S. Hand. The Hollenden, 1891. Liberty Holden, publisher of the Cleveland Plain Dealer, built the Hollenden to rival the nation’s largest and most lavish hotels in New York and Chicago. For the city’s boosters, the Hollenden Turn-of-the-century travelers feared fires in densely populated highrise hotels with no easy mode of mass evacuation. emblematized Cleveland’s rapid rise to the top ranks of American cities. The hotel’s facade stretched hundreds of feet down both Superior Avenue and Sixth Street, presenting “smooth surfaces which would not become easily soiled by the soot-laden atmosphere of the busy manufacturing city.” The ornate roof of the corner tower invoked European chateaux. In the lobby, a stained glass skylight cast colors from thirty feet above onto intricate paneling and a green and white marble floor. The reception desk, an altar in this cathedral of luxury, stood opposite the hotel’s main entrance. During a period that gave birth to the phrase “conspicuous consumption,” the Hollenden embodied it. 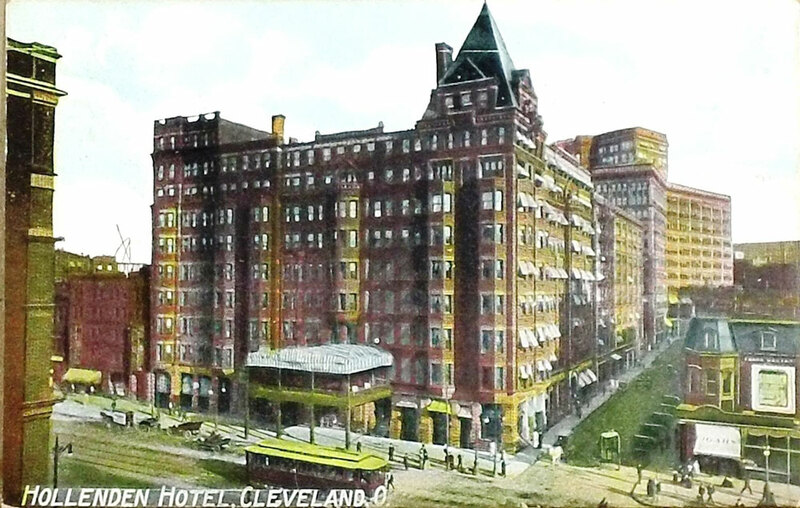 Cleveland’s emergence as a manufacturing and transportation center made the Hollenden possible, but the building’s designers did everything to distance the hotel from the brutality of labor in railyards and factories, creating a sanctuary of opulence for those who could afford it. 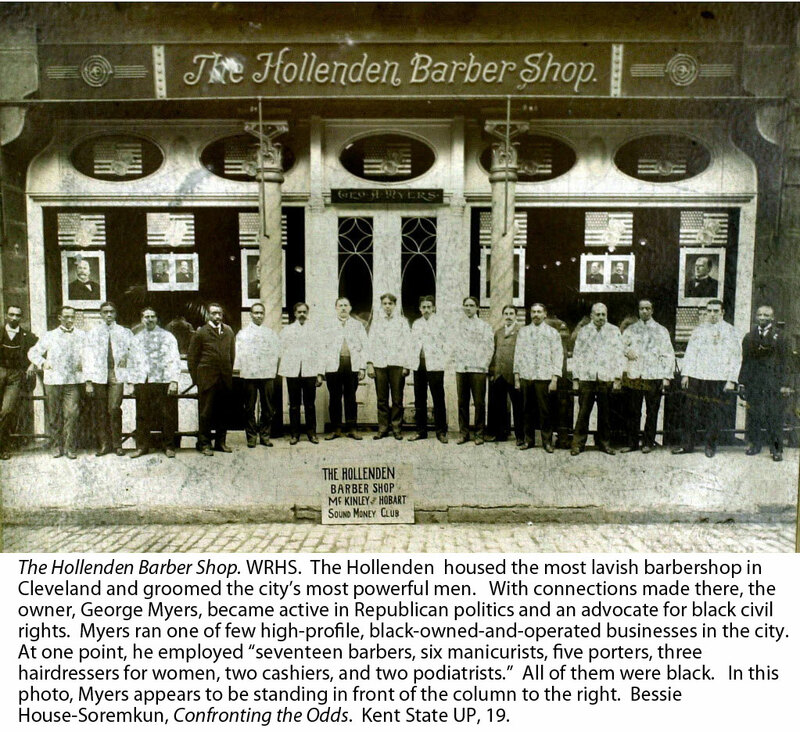 In the Hollenden’s dining rooms, billiard hall, bars, and shops, Cleveland’s business, political, and social elites joined out-of-towners to plot the city’s future. Others simply made the hotel one stop among many during a night in Cleveland’s most active entertainment district. Windsor Hotel Fire, 1899. MCNY. The New York Times reported that people trapped on the upper floors grew “frantic with fear and hurl[ed] themselves” to death on the sidewalk (NYT, March 18, p.1).But for all of its cultivation of sophisticated leisure, the Hollenden confronted some of the same hazards that plagued industrial buildings. For good reasons, turn-of-the-century travelers feared fires in densely populated highrise hotels with no easy mode of mass evacuation. In 1893, a fire at the Newhall House in Milwaukee killed at least sixty-four people. 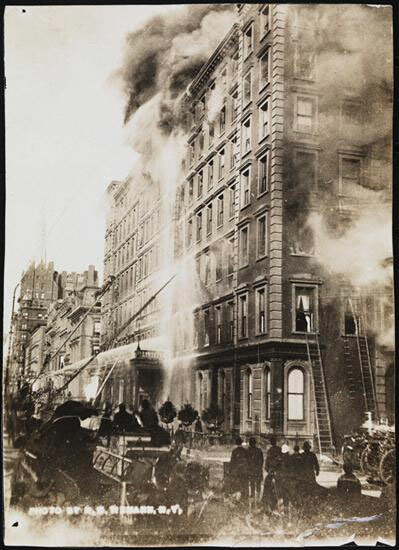 In 1899, New York’s posh Windsor Hotel burned to the ground, killing eighty-six. 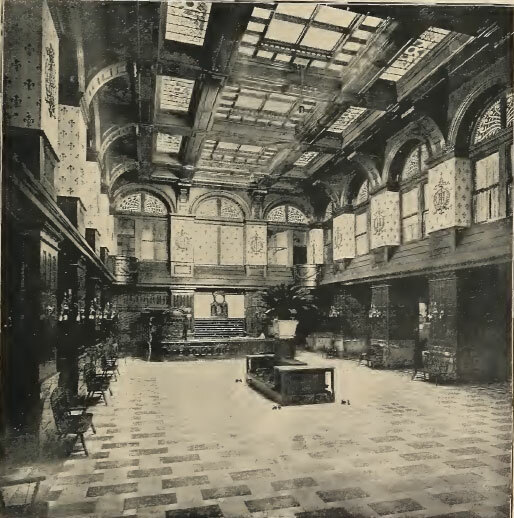 To soothe the apprehensions of its affluent clientele, the Hollenden advertised not just its sumptuousness but its safety, claiming that the building was fireproof. “Most hotels that lay claim to fire-proof qualities are frequently found not to possess essential . . . features,” said one promotional piece. In the Hollenden, by contrast, “All structural, hence vital portions . . . are secured from the effects of fire.” The hotel was not, of course, fireproof in any absolute sense, but builders went to extraordinary ends to shield combustible materials from the possibility of igniting. They sealed all structural timbers in terra cotta. Heavy mineral wool provided fire blocks between floors. Brick walls extended from the ground to the roof, theoretically preventing the spread of fire from one room to another. Wire rather than wooden lathing lay behind the plaster. In short, the Hollenden did what it could to prevent the rapid spread of fire, if it were to break out somewhere in the crowded hotel. Years before Collinwood expanded the Lake View School, architects recommended non-combustible materials for school construction and interior stairwells sealed off by fireproof doors. Large urban school districts occasionally followed some of this guidance, but outlying and rural districts almost never did. The Lake View school’s stairways were built of pine and wide open, providing the perfect path for fire to race upward from the basement. Business imperatives drove the Hollenden to make sure that its prosperous guests could enjoy the pleasures of the district and sleep soundly and securely on the tenth floor. In Collinwood, no one bothered. 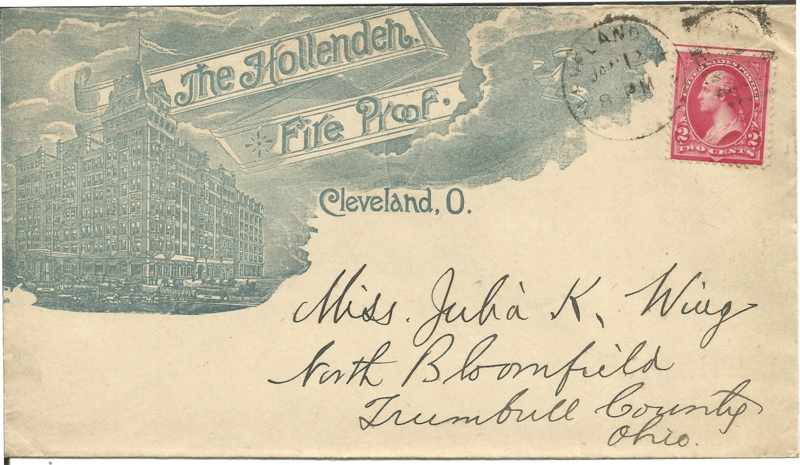 “Fire Proof” Advertising Card, c.1900. PC.